Military bands are an integral part of Hebrew music culture. This collection has 14 discs and 300 songs - the best loved songs of all the military bands and Choruses. Over the years, military bands occupied a prominent place in the Israeli entertainment landscape and provided a long list of stars throughout the years of their activities. 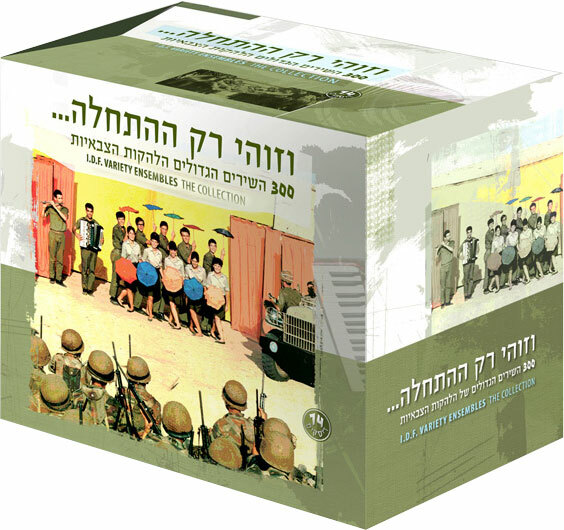 The enormous cultural contributions of the IDF bands are expressed in dozens of hits, many of which have become full-fledged Israeli classics. Some maintain that military bands are the essence of Israeli culture itself. Now, marking the 60th anniversary of the first military band (Nahal Band), NMC is proud to present: This is Only The Beginning - 300 of the greatest songs of the military bands. This package contains no less than 14 discs and 300 songs - the best loved of all the great songs of all the military bands from their start in the beginning in the early fifties to when they stopped their activities in the late eighties. The smaller army entertainment groups are not forgotten in this collection and their greatest songs are also included. The last disc of the set has 20 songs and instrumental pieces that have never been offered in any commercial offering and hence, this is their official premier. The Set includes a brochure of 200 pages that contains all the song lyrics. This Collection brings together for the first time, all the hits of all the stars in one fancy gift package.